Using a toothpick, skewer all ingredients. 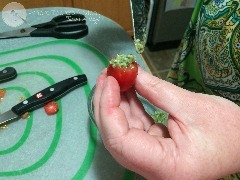 If you have a larger leaf of basil fold in half then skewer. 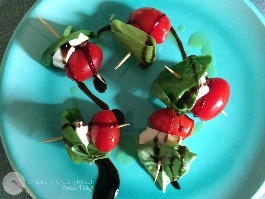 Drizzle with balsamic vinegar and extra virgin olive oil and serve. 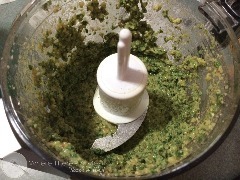 In a food processor, blend all ingredients of pesto until a smooth consistency is reached. 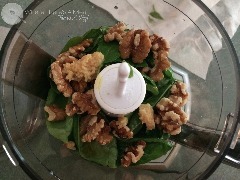 Here is what the finished pesto will look like. Note: This step can easily be omitted by using store bought pesto if desired. 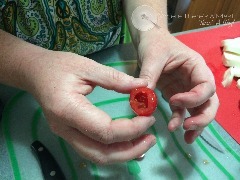 Wash tomatoes, cut the top off and scoop out the inside of the tomato. Stuff with a small wedge of mozzarella cheese. 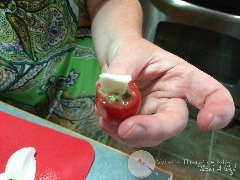 If you cut into a small triangle it fits in the tomato nicely. 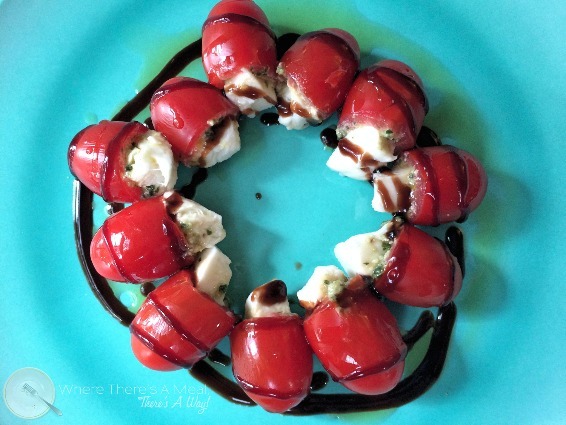 Arrange on a serving plate and drizzle with balsamic vinegar glaze and extra virgin olive oil. 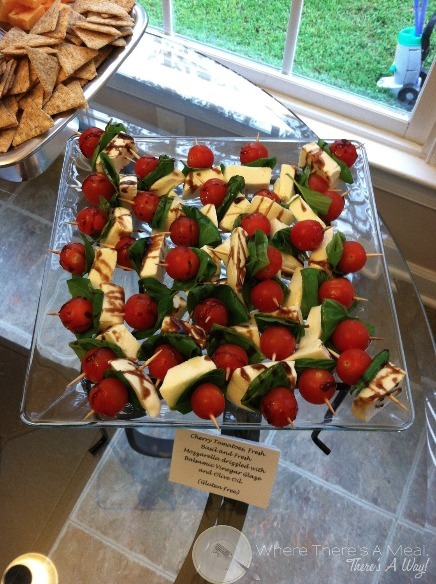 First time I made the caprese salad bites, I was hosting a bridal shower for a gluten free bride. I was serving appetizers and desserts, bite sized treats if you will, and had to think outisde the box as most appetizers, desserts (well let's be honest, most things I eat) had gluten in them. This was the perfect salad, because there was no need for a plate or silverware making cleanup a breeze (victory) and had zero gluten. A couple nights ago I noticed my basil plant was growing out of control, so I needed to think of a way to use my delicious herb before it went to waste. I made a makeshift pesto using ingredients I had, and decided to stuff the tomatoes with the homemade pesto. Making pesto requires way more basil then just the one leaf each the caprese salad bites need, and being that I had a surplus of basil, pesto was the way to go. Almost the same ingredients, just served in a new way. Joe thought they were awesome, and quickly asked if I would make him some moreA. Have an overgrown basil plant, or just looking for a quick gluten free appetizer, well look no further because, where there's a meal, there's a way! 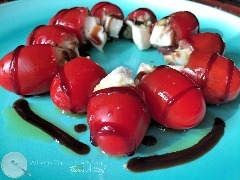 A photo of the Caprese Salad Bites from the gluten free bridal shower I threw.